In a medium bowl, combine the dry ingredients together and whisk well. In a large bowl, add in wet ingredients and mix until well incorporated. Add dry ingredients and whisk until the batter is smooth and lump free. Using an 8” (20 cm) round tin or cast iron skillet, add in half of the melted butter and when it starts to bubble, pour in half of the batter. Immediately transfer the tin into a preheated oven at 220°C/420°F and bake for 15 mins or until well risen and golden brown. It will puff up a lot (no fix shape) but will sink when you remove from the oven and that is absolutely fine. 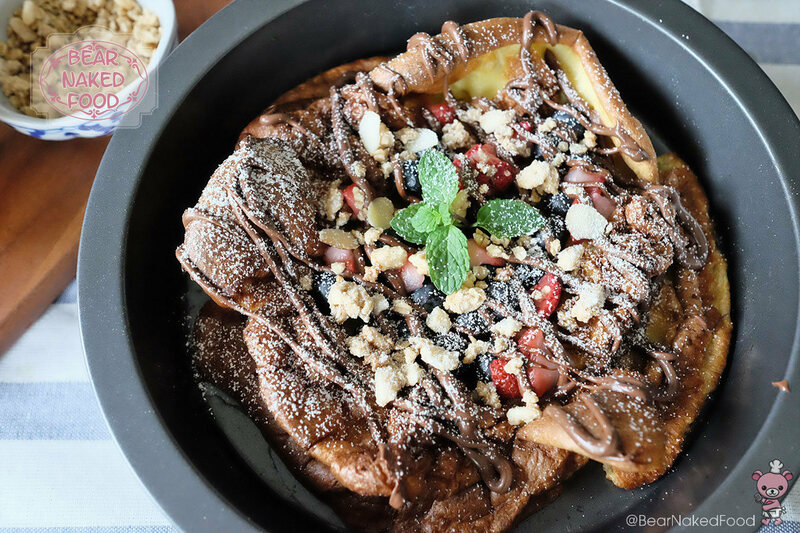 Fill the pancake with the berries, drizzle Nutella or chocolate sauce and granola all over and finish off with a dusting of icing sugar.